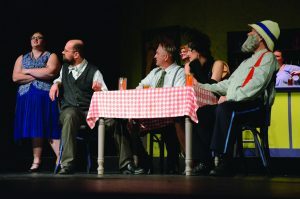 Loras College hosted the 25th anniversary of the faculty/staff play tradition with “Twisted River of Redemption,” the final part of the “Twisted River” trilogy, on Aug. 31 and Sept. 1 and 2. The trilogy, written by Kyle Klapatauskas and directed by Doug Donald, follows fictional character Louis Button (Brad Cavanagh) and his crew and includes a plot to take over Loras College. This installment centers around the evil Dr. Coventry (Fr. Dennis Miller) and his apprentice Edna (Stacia McDermott) as they plot to turn Loras into the world’s largest speakeasy. The comedy/melodrama set in the 1920s kept the audience laughing well after curtain call due to its jokes and jabs at the things that make Loras Loras. “Fictional Loras history with some real historical things embedded” is how Jake Kohlhaas (Fr. Conry) described the setting and theme. For example, Fr. John Conry was the longest-serving president of the college. Klapatauskas nodded to that in addition to making his character the interim assistant auxiliary associate dean of academics, the interim director of human resources, the interim director of security, the interim-interim director of institutional resources, and an interim backup dancer. “The roles that people played this time was the most fun; it’s always great when people get to dress up. It’s interesting to see when the chair of your faculty – John Eby’s our faculty chair, a really important guy around here – and when he’s dancing around dressed as a nun and as a sheriff and then as a dancer, it really is funny to watch,” said Cavanagh. Due to the popularity of the first two installments, Klapatauskas had to write in roughly 14 more parts after auditions in order to incorporate everyone who wanted to partake. The now-35 person cast had their work cut out for them. It was during rehearsals that the cast really came together as a community. “We all realized (during rehearsal) that this is definitely not our day job and we’re just going to have fun doing it, so I think everyone supports everybody else in trying to do a good job, and I think, to me, that’s the most fun part about it,” said Cavanagh. “It was a great bonding time; a great time to get to know people,” said Kohlhaas. 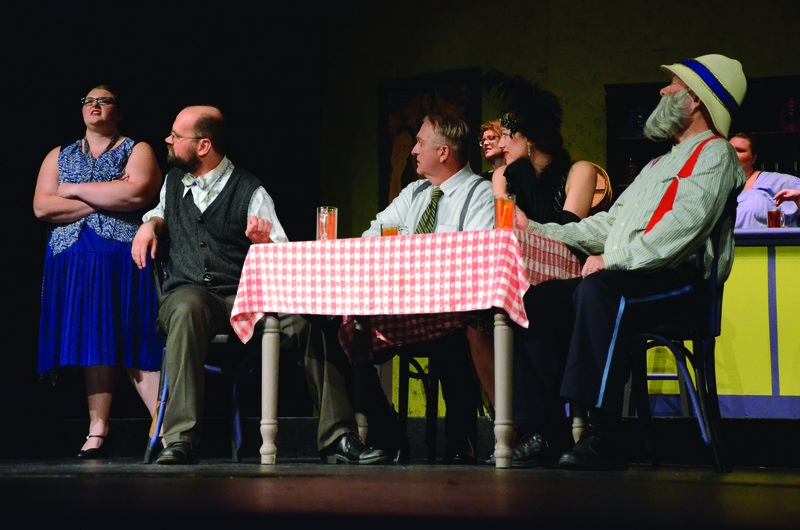 While Dr. Jon Burney started the tradition of the faculty/staff play as a fundraiser for the Faculty/Staff Scholarship fund, it has grown into a social and bonding experience for Loras College as a whole, and the addition of the comedy factor in this trilogy only added to that. While this may be the conclusion to this trilogy, the biannual tradition will surely live on. “I just think it’s really unique; I haven’t heard of any other college where faculty and staff do this for a scholarship fund. It’s just a really great campus experience. It shows a lot about Loras,” said Kohlhaas.